Free glucose in the body is just ~10g (distributed in extra-cellular fluid) & a tidal wave of glucose entering minutes after meals of these refined carbohydrates must be rapidly removed; most becomes fat. The “glycemic hypothesis” of obesity is that foods that substantially increase glucose levels after meals (postprandial) cause greater fat deposition while also increase hunger and decrease satiation (the impulse to stop eating) leading to a vicious cycle of over-consumption and weight gain, nevertheless these revelations have not greatly changed consumer behavior or the food industry as 50-60% of all calories consumed in the Western Diet are in the form of high glycemic foods, starches and sweeteners such as flour, potatoes, rice, corn syrup, corn flour and sugar. If nothing else the data presented here should expose the error in the dogma “a calorie is a calorie” as different foods produce profoundly contrasting biological consequences. 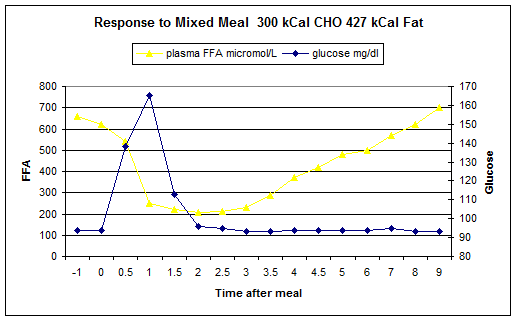 The important point here is that relatively small amounts of glucose absorbed with a mixed meal prevents energy metabolism from the fat component of the meal for several hours. The serious problem of low fat foods when fat is replaced with high glycemic carbs is the increased hunger associated with suppression of free fatty acid nutrient levels for several hours after a meal (2). 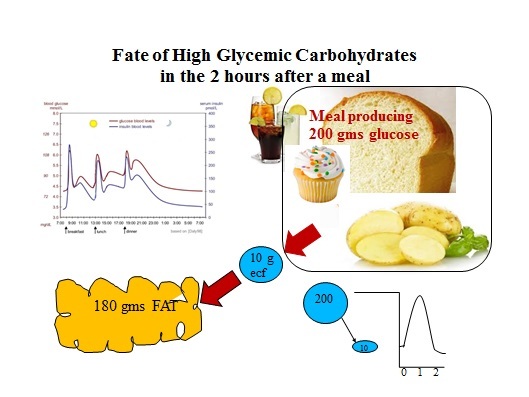 The cycle of fat storage and hunger goes something like this: even a modest 100 gm serving of HGC (high glycemic carbohydrate) as part of a mixed meal will increase blood glucose 2 fold within 1 hour and increase insulin 10-15 fold. Insulin stops metabolism of fat in favor of glucose and excess glucose above energy requirements is converted to fat. In healthy individuals glucose levels return to normal within 2 hours but plasma free fatty acid levels remain suppressed for much longer (1) and activate hunger sensors in the brain which perceive an energy deficit due to decreased fatty acid oxidation (2). The two figures above show the difference between a high fat meal (427 Cal of fat) with either 300 Cal or 40 Cal of carbohydrate. The 300 Cal of white bread and jam meal spikes blood glucose and suppresses Free Fatty Acid levels whereas the low carbohydrate meal there is very little change in glucose or FFA levels. 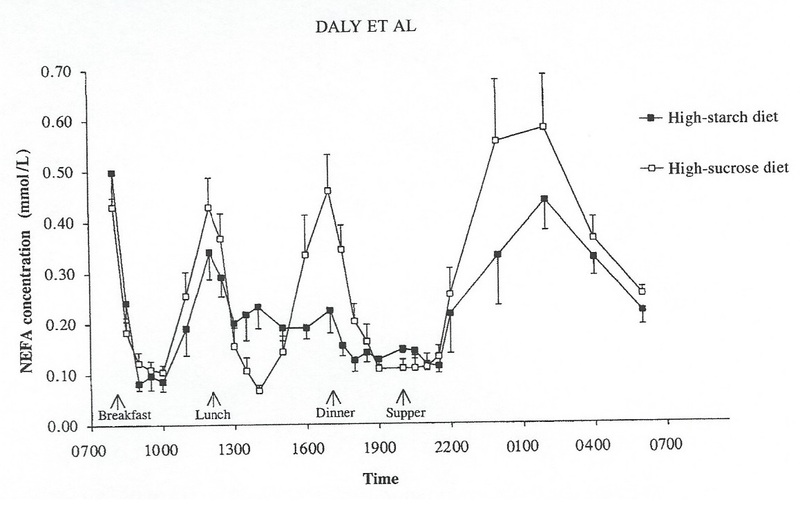 The above graph from Daly et al 1998 shows daily variations in free fatty acid levels (labelled here as NEFA: non esterified fatty acids) with two diets with carbohydrate content containing either starch or sugar. Note profound suppression of NEFA levels throughout the day which was especially prolonged with the high starch. There is much confusion about the role glucose plays in providing “energy” for everyday activity. The amount of glucose present in extracellular fluids (ECF) of the body at any one time is just 10 grams which represents just 40 Calories and the body’s energy requirements at rest are around 100 Calories an hour which can rise quickly to 400-1000 Calories/hr with exercise. 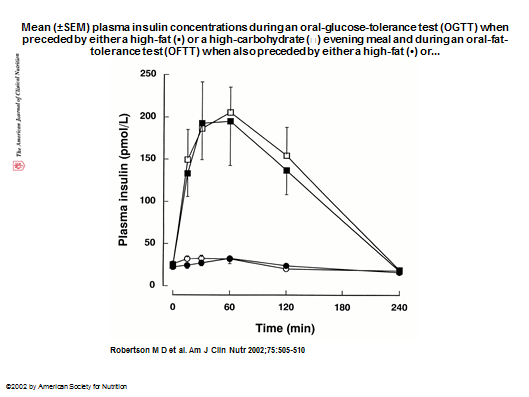 Clearly this energy cannot be taken from ECF as the disappearance of 2 gms of glucose a minute from the circulation for energy use during exercise would produce life threatening hypoglycemia within 5 minutes, instead of using glucose for energy efficient mechanisms have evolved to preserve glucose for brain activity and prevent glucose metabolism in muscle in favor of fatty acid oxidation. Exercise involves suppression of energy production from glucose, accomplished by subconscious increase of sympathetic nervous stimulation which suppresses insulin secretion and increases pancreatic glucagon secretion favoring use of fat for energy and synthesis of glucose and preservation of steady blood glucose levels necessary for brain activity. However high or low glucose levels are equally dangerous in the long run. The huge increases in glucose and insulin with typical meals from our modern diet is because they produce a daily average of 550 gm (1.25 lbs) of glucose where up to 200 gm can be absorbed in the first hour after a meal swamping the 10 gm pool in the ECF and spiking blood glucose levels which produces a spike in insulin secretion allowing rapid entry of glucose into all of the tissues of the body and the excess glucose (in this instance 180 gm after a typical meal) must be converted into glycogen or fat and because most of the time our glycogen stores are saturated most of the excess is stored as fat. The important question remains how damaging is this typical thrice daily cycle of postprandial hyperglycemia that is accepted as normal with our modern food habits. One result is that any associated fat consumed along with the meal is not oxidized but also stored (1), which explains why fat is far more fattening when accompanied by small amounts of sugar or starch. 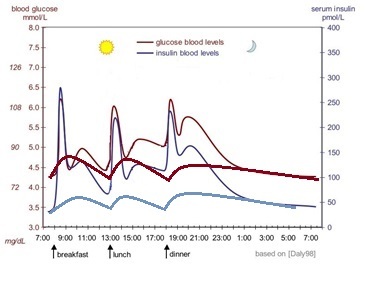 The graph above (adapted from Daly et al 1998) shows glucose and insulin levels during the day with mixed meals containing 2 types of carbohydrates. 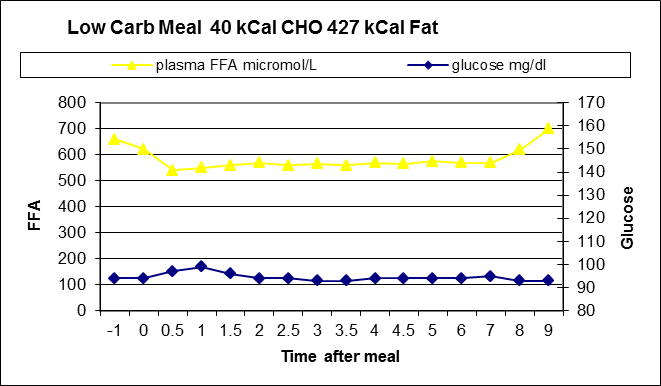 The fine lines show changes of meals containing some high glycemic starch. The bold lines are predicted changes expected with low glycemic foods or fiber. Hugely fluctuating insulin secretion is dependent on rapid rises of blood glucose typical of our customary Western Diet. given 100 grams of glucose (squares) or 40 grams of fat (circles). amino-acid levels but fat has no insulin stimulating effect. 1. Effects of Dietary Fat on Postprandial Substrate Oxidation and on Carbohydrate and Fat Balances. J. P. Flatt, Eric Ravussin, Kevin J. Acheson, and Eric Jequier. s.l. : J. Clin. Invest. t© The American Society for Clinical Investigation, Inc. , 1985, Vols. Volume 76, September 1985, 1019-1024. 2. SCHARRER, ERWIN. Control of Food Intake by Fatty Acid Oxidation and Ketogenesis. . s.l. : Nutrition Vol. 15, No. 9, 1999.